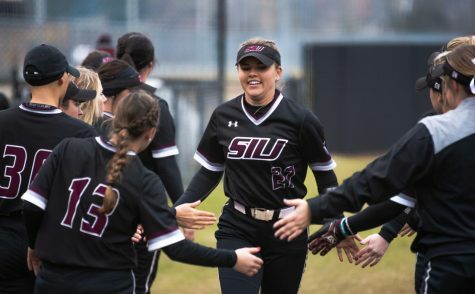 SIU and SIUE took to Charlotte West Stadium on Wednesday in a battle for southern Illinois softball supremacy with the Salukis claiming the 5-1 win. 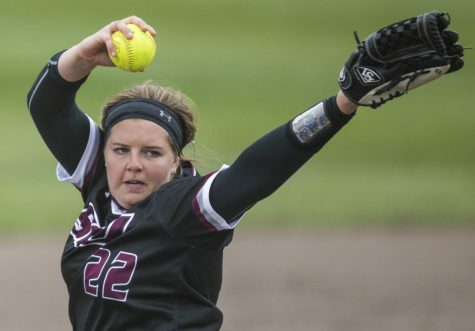 The Salukis (12-14-1) defeated the Cougars (27-7) in a seven-inning pitching duel-turned SIU offensive explosion, between senior Katie Bertlesen (10-7) and freshman Baylee Douglass (10-3). 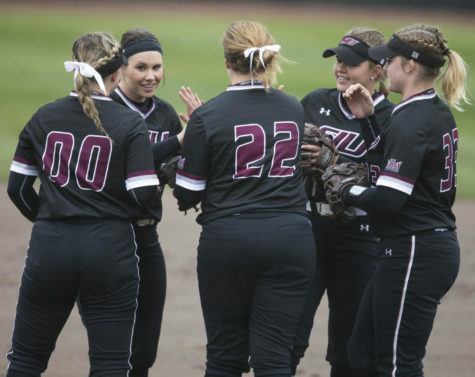 In the first 27 minutes of the game Douglass struck out seven of the first nine Saluki batters and each pitcher carried a no-hitter to the fourth inning. Cougar senior left fielder Rebecca Gray led off the fourth inning with a triple and would come around to score on senior short stop Alex McDavid’s single. 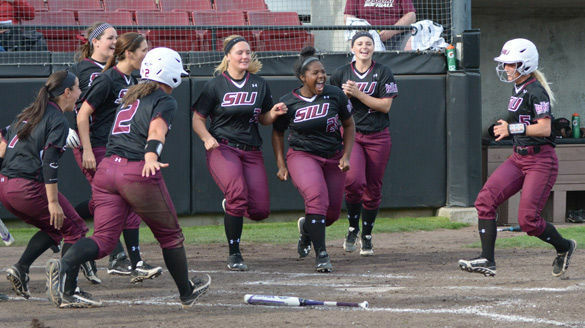 The Salukis answered back in the fifth inning with junior designated player Lacey Newbold’s first career home run. Her 2-run blast to right field scored sophomore third baseman Brook Womack who reached on a leadoff double. 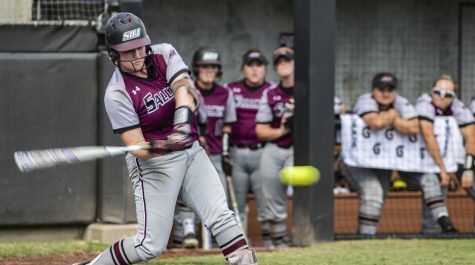 Newbold said she choked up on the bat and shortened her swing before the home run and knew it was gone when it left the bat. 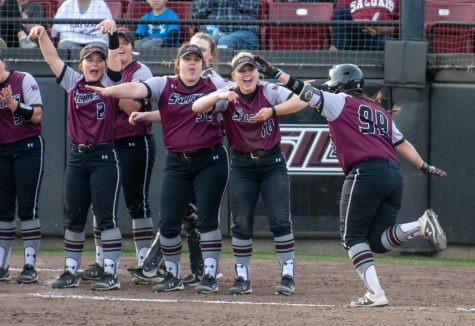 Coach Kerri Blaylock said Newbold’s home run was crucial. “It was huge because it was that first big moment where we got a cut off of [Douglass],” she said. 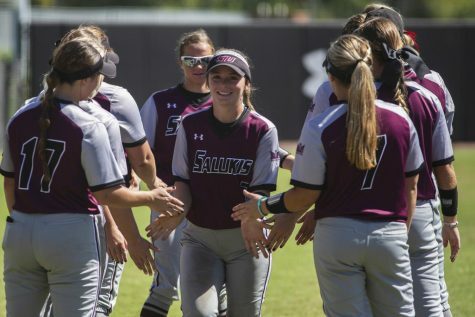 SIU led off the bottom of the sixth with a single by junior shortstop Kelsey Gonzalez, a double by senior center fielder Kalyn Harker and walk by sophomore left fielder Merri Anne Patterson. 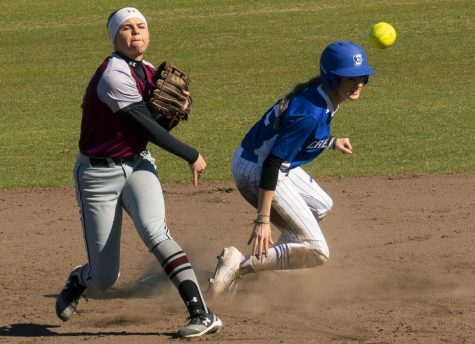 With bases loaded and no outs, sophomore first baseman Shaye Harre scored Gonzalez with a sacrifice fly before a 2 RBI double by freshman catcher Sydney Jones made the game 5-1. Bertelsen finished off the Cougars in the top of the seventh, earning the win finishing with 3 hits, 1 run, 4 walks and 2 strikeouts. Douglass picked up the loss allowing 5 runs on 6 hits, 1 walk and striking out 11. 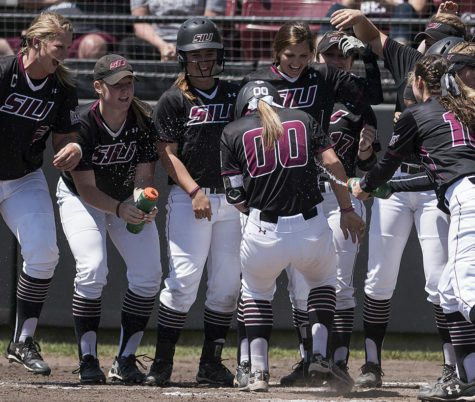 Bertelsen said she did not change her approach as Douglass was striking out Salukis. 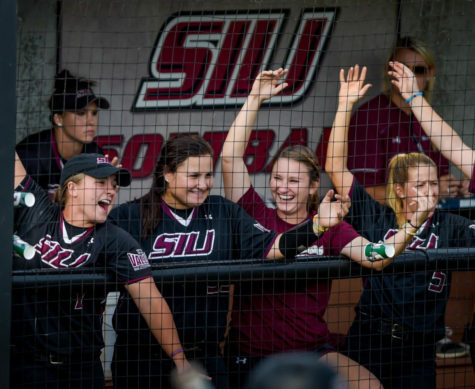 The Salukis return to Missouri Valley Conference play with a weekend series against the Illinois State Redbirds beginning 4 p.m. Friday at Marian Kneer Softball Stadium in Normal.